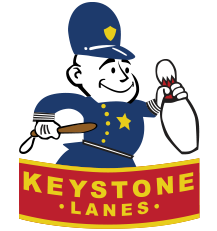 Your Next Bowling Event Awaits You at Keystone Lanes! All birthday parties are a two-lane minimum. A $30 per lane non-refundable deposit is required. Maximum 5 guests per lane. Celebratory desserts (cake & ice cream) are welcome, but no other outside food or drinks.